This article is also featured in the May/June 2017 issue of THE DARK PAGES film noir newsletter edited by Karen Burroughs Hannsberry. For information on the bi-monthly publication, Click here. During Turner Classic Movies’ 8th annual film festival in April, more than 75 films were shown over the event’s four day run. All films screened were classics and almost all of them appealed to me. But there were two that I was determined to see: The Powell/Pressburger tour de force Black Narcissus (1947), presented on nitrate-based film stock, and the less well known newly restored French film noir, Panique (1946), from director Julien Duvivier (1896 – 1967). Panique might not have caught my eye on the intensely packed festival schedule had I not, thanks to Don Malcolm and his Mid-Century Productions, been recently introduced to French film noir. Last November I attended Malcolm/MCP’s 3rd French noir fest in San Francisco. That illuminating event featured 15 “black” French films, including Le Dernier Tournant (1939), director Pierre Chenal’s adaptation of James M. Cain’s The Postman Always Rings Twice. Memorable in the role of Cora’s husband Nick (played by Cecil Kellaway in MGM’s 1946 version) was Swiss actor Michel Simon, one of the great character actors of French film. 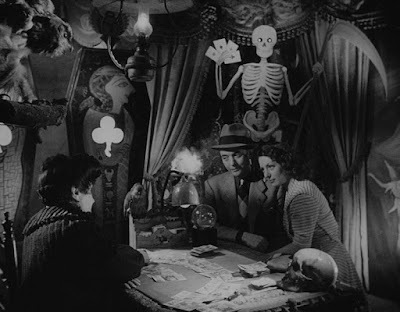 When I discovered Panique on the TCM festival program I was intrigued: French noir at the hand of Duvivier, an icon of French Classical Cinema, admired by Welles, Renoir, Bergman, and other filmmakers of great legend. But the direction of Julien Duvivier wasn’t Panique’s only attraction for me. Michel Simon in the leading role also piqued my interest; his performance as hapless Nick in Le Dernier Tournant was remarkable and he was quite a bit more convincing than Cecil Kellaway in the Hollywood rendition of The Postman Always Rings Twice. My friend and fellow classic film blogger/writer Christian Esquevin and I planned to have lunch and then make our way to the TCM festival screening of Panique at Hollywood’s Chinese Multiplex. Lucky Christian, who was born in France and is fluent in the language, would not have to bother with subtitles! What neither of us anticipated was that by the time we arrived the theater would be full and, though we would be able to find seats, we wouldn’t be sitting together. Before the film began Pierre Simenon, son of prolific best-selling crime novelist Georges Simenon, was interviewed onstage. The elder Simenon was the creator of Inspector Maigret and the author of the novel Panique is based upon. Pierre Simenon is an entertainment lawyer with an insider’s understanding of filmmaking and filmmakers, and a captivating raconteur. 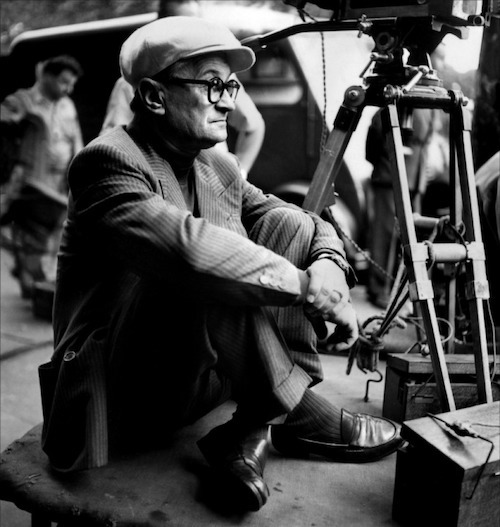 Among many anecdotes, tales of his father’s friendships with the likes of Chaplin, Renoir and Fellini were told. By the time the credits for Panique rolled, the entire audience was properly mesmerized. Rarely seen in the decades since its initial release, Panique was the first film Julien Duvivier made once he returned to France after spending the war years directing mostly formulaic movies in Hollywood. Though he possessed the range to make successful films of widely varying genres, Duvivier acknowledged that he was naturally drawn to “harsh, dark and bitter” themes, and Panique doesn’t blink in its chilly observation of human nature’s seeming penchant for mischief and outright cruelty. The film tells a grim tale of murder, blind passion, betrayal, and mob mentality. An eccentric loner, Monsieur Hire (Michel Simon), becomes smitten with a new neighbor (Viviane Romance), a young woman just out of prison for a crime her lover (Paul Bernard) committed but for which she willingly took the fall. M. Hire watches her from his room at night and follows her when she is out with her boyfriend. In the meantime, the body of a local woman who has been murdered and robbed is found in an empty lot where a carnival is about to take place. As gossip and speculation flourish about who the killer might be, the entire neighborhood grows increasingly abuzz with suspicion. As for our protagonist, M. Hire, he reveals during the police investigation of the murder that his name is actually Hirovitch, the inference being that he’s Jewish. Though he doesn’t fit in and is condescending toward the local milieu, M. Hire is clearly not the murderer. But his head has been so turned by his enchantment with the young girl he desires that he fails to see he’s being systematically framed for the killing and set up to become a victim of vigilante justice. Michel Simon delivers a powerful and complex performance as a proud, enigmatic outsider who is singled out and targeted because he is different and stands apart from the crowd. Viviane Romance and Paul Bernard are strong in their portrayals of femme fatale and petty criminal. Also well and colorfully cast are the supporting roles of butcher, tax collector, prostitute and other petit-bourgeois neighborhood folk. Panique was among the “masterpieces of renowned filmmakers” that were showcased as part of the Revivals section of the 54th New York Film Festival last fall. The TCM festival screening this spring launched a Rialto Pictures-promoted tour of the newly restored print to major cities around the U.S. Hopefully Panique, a film hailed by critics as diverse as Bosley Crowther, Pauline Kael, and Leonard Maltin, will become more available to a larger audience. 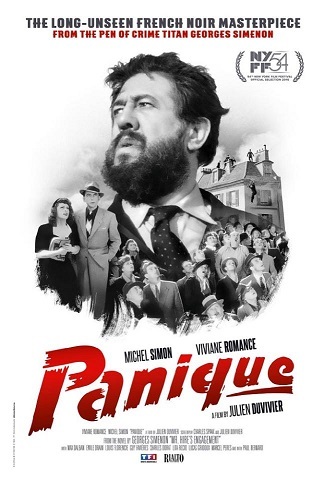 Perhaps the Criterion Collection, which already includes several other films of Julien Duviver, will soon add Panique, one of his very best and most timely films, to its list of new releases. This is a great film, and you do it justice here Lady Eve. I enjoyed viewing this film with you, albeit rows apart, and now reliving the experience in your descriptive and informative review. Movie-goers in Los Angeles are fortunate to have the opportunity to see this dark drama. Dystopian movies are everywhere nowadays, but this caustic noir is much closer to reality. It is always a pleasure to be able to spend time with you, Christian. PANIQUE was, for me, one of the highlights of the TCM festival and I'm so glad we were able to share the experience if only from a distance. "Caustic noir" is a perfect description for this film, which speaks volumes to today's social environment.